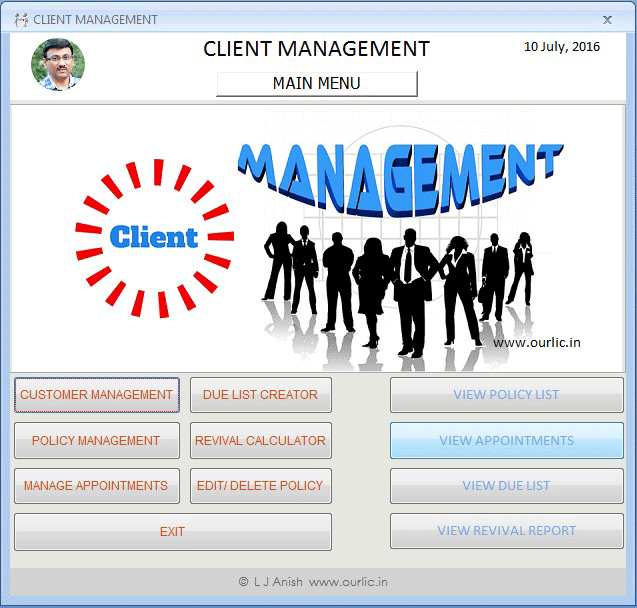 Our LIC has released the completely redesigned full version of popular CLIENT MANAGEMENT SOFTWARE (Windows Version) for free. The full version of Client Management Software will be an excellent tool to manage all your clients in a single place. Two important facilities provided in this software includes ability to create a Due List for any month and Late Fee and Revival Amount calculation for all the included policies in a single process. Client Management Software is developed keeping in mind the needs of Insurance Advisers and Development Officers, but it can be a handy tool for any marketing official as well. Client Management Software provides following facilities in a user friendly manner. Complete details of policies of individual customers can be added through this module. Any number of policies can be added under each customer. Policies can be accessed any time using special reports generated. Appointments of your clients can be easily managed through this module. Date, Time and type of contact can be recorded here which can be accessed through reports. Due List Creator is a powerful tool which can be used to create and check the due list of all the entered policies in a user friendly manner. This facility has been a long pending demand of the users of earlier version of Client Management Software. Revival and Late fee amount calculator can calculate the late fee and revival amount of all your policies in a single process. The calculated revival amount and late fee is provided in a beautiful and user friendly report for easy follow up. If you have any problem in running the software the possible reason could be Microsoft Access 2007 is not installed in your system. The remedy is to download and install the Access 2007 Run time which is available for free from here. Download Client Management Software by clicking in the button provided below.